I love everything about this time of year! I love the fashion (the scarfs, gloves and hats), I love the outdoors (the snow-capped trees and mountains), and I love all the seasonal vegetables and fresh herbs. Pumpkins, squash, yams, thyme, rosemary and sage…. Need I say more? If I could give the holidays a “taste”, a spoon of this roasted butternut squash soup would define that “taste”. 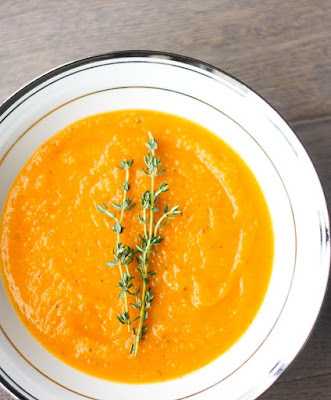 This soup gets a little kick from the red pepper powder. If you are adverse to a little spice, I would recommend that you add less red pepper powder and once the soup has been pureed, add more as desired to taste. 0 Response to "ROASTED BUTTERNUT SQUASH SOUP"